Gone are the days of sweet halloween costumes at our house. No more kitty-cats, and windmills, or cars. 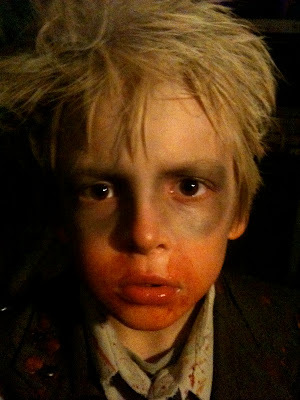 This year he had to be a zombie. A dead, decaying, filthy, bloody ZOMBIE. He had decided this costume on the day after Halloween of 2010. I *sigh* agreed to make it. We made a sketch, and decided all the things that we wanted this costume to include. 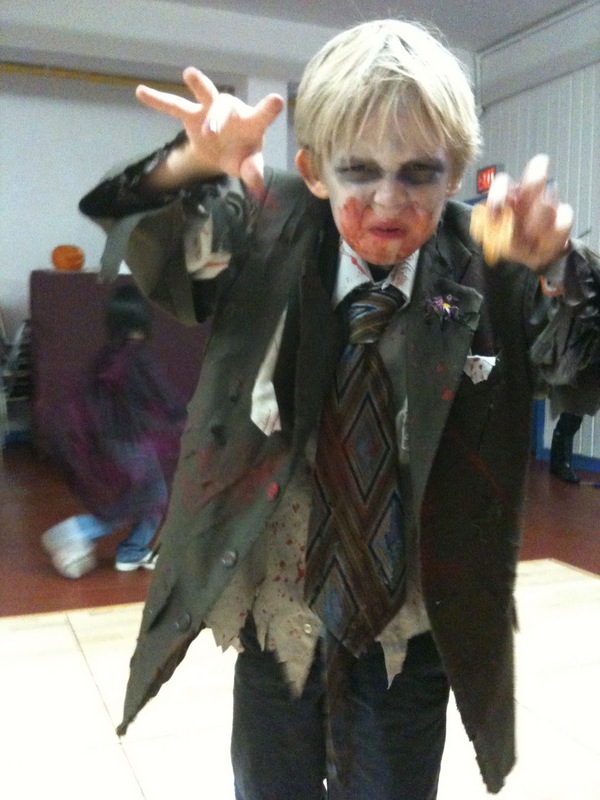 He was going to be a Businessman Zombie. We didn't get into the details of how this businessman died. We found an old recycled cell phone, and this is how the costume began. Next we made a trip to the Value Village. We found a blazer, collar shirt, and a tie. We also picked up some makeup colours that we were missing, (green and grey) some spray-on grey hair colour, and a tube of gel blood (of course) Total spend $21. A pair of his own chinos from the "to be repaired pile" completed the look. Next we got to the distressing. We slashed, and tore, and splattered with red acrylic paint. We dragged the clothing behind the wagon, and drove over it with the car. It was tossed into the middle of the street and we persuaded reluctant and confused drivers to please drive over it. All the while, my son was squealing with delight. We smudged it with moss, and smeared it with leaves. Finally, I sewed on some rubber cockroaches and worms. He wore it to Beavers for the annual Halloween Party, and all day and all night of Halloween. He really loved it, and I had fun making it. Next door, our neighbours spend an enormous amount of time and effort setting up a haunted house and yard. It is a neighbour destination on Halloween night. My son hangs out and "helps" them set it up, the whole weekend before Halloween. He has seen it being built, and knows fully what to expect, but he still cannot bring himself to go in and trick or treat on the big night. Perhaps there still might be a little kitty-kat inside him.